Eleven protesters were detained by police near Governor Pat McCrory’s office in the Capitol Building in Raleigh Monday night, and released with citations about two-and-a-half hours later. Rajendran was one of 11 people cited Monday just after 5 p.m. near the governor’s office in the Capitol Building. She told WCHL that a larger group of protesters assembled in the building earlier that afternoon. When police announced it was time to leave at 5 p.m., most did. But 11 of them refused. They were detained briefly, and released to a cheering crowd at around 7:30 p.m.
They’re scheduled to appear in court on August 15, on charges of second degree trespassing. For most of the protesters, the evening started with hundreds gathered in Halifax Mall, outside the Legislative Building, which was locked to visitors. The Senate had the day off, and is not scheduled to convene until Wednesday. The House was in a brief skeleton session earlier Monday afternoon, with no votes planned. The main themes of Monday’s rally were the environment, and health care. Protesters had fresh grievances regarding both issues. On May 29, the legislature quickly turned around a bill to allow fracking permits in North Carolina, and Governor Pat McCrory is expected to sign it into law shortly. Jerry Ensminger is co-founder of The Few, The Proud, The Forgotten, an organization of Marines and Naval personnel dedicated to protecting the rights of those exposed to contaminated drinking water at Camp Lejeune between 1957 and 1987. 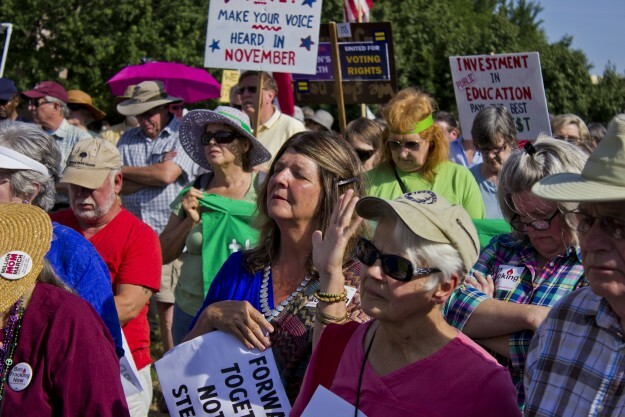 Protesters who were already angry over the refusal of McCrory and the Republican-controlled legislature to expand Medicaid under the Affordable Care Act were now livid over the $21.1 billion budget that passed quickly in the Senate, shortly after midnight on May 31. The budget includes Medicaid cuts to the elderly and disabled. That angered Leslie Boyd of Candler, North Carolina. She began her address to the crowd by talking about her son Mike, who died of colon cancer on April 1st, 2008, two years before the Affordable Care Act was passed. According to Boyd, Mike was denied insurance because of a birth defect that made him susceptible to colon cancer. She had some stinging words for conservative lawmakers that have blocked Medicaid expansion. Former North Carolina Americans for Prosperity Director Dallas Woodhouse was there, as promised, to poke fun at protesters by handing out what he called “sun-shaped stress balls,” which were basically soft little yellow squeeze toys that looked like little suns. Woodhouse, whose new conservative advocacy group is called Carolina Rising, explained his intentions to WCHL, while his lone companion, who appeared to be a young woman in a sun costume, stood by. Most hardly seemed to noticed him, but his sunny sarcasm earned Woodhouse a few glares from people in the crowd. One elderly woman resting under a shady tree with an oxygen tank looked like she could have incinerated him with her eyes. Woodhouse also caught the notice of the NAACP’s security for the event, who told Woodhouse that organizers had a park permit, and he wasn’t welcome. The leader of the Moral Monday movement, Rev. William Barber, told rallyers that next week’s gathering would focus on education.